Marcela Mesa is from Colombia. She has been studying at EC New York 30+ school since June 12th and will continue to study until July 7th. Here is some more information about her experience at EC New York. Why is she studying English? 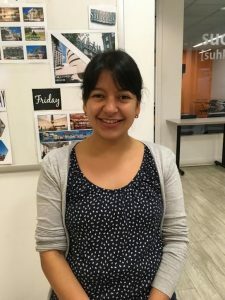 Marcela is studying English for her job back in Colombia where she teaches pharmacy at a university. Why is she studying in NY? The university that she is employed for sent her here to study English, nevertheless she loves it here! What is the best thing about living/studying in New York? New York is an interesting city with many things to do which is great for someone like her who likes to travel. Already she has gone to some famous places such as Broadway. With New York being a multi-cultural city, she can experience all kinds of cultures here during her stay. What does she like best about EC New York? She likes how EC New York is in the center of New York City. The classes themselves are great because the teachers speak slowly for students to easily understand and learn English. What plan does she have after she graduates here? She plans to return to her university and teach what she has learned here. Thanks, Marcela! You could also take Adult English Courses in New York like Marcela at EC New York.